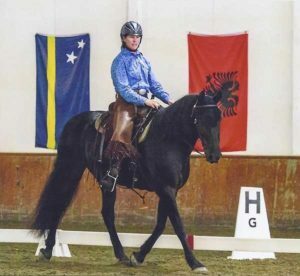 All levels of riders, from beginners to experienced competitors will discover how the Centered Riding basics help to improve comfort, relaxation, communication, confidence and balance for both the horse and rider. All levels and breeds of horses welcome. Keep an eye on the schedule for new dates and locations or click here to learn about hosting your own event. Horse Speak is a practical system for “listening” and “talking” to horses in their language, instead of expecting them to comprehend ours. Horse Speak can be used by anyone who works with horses, whether riding instructor, colt starter, recreational rider, or avid competitor. It promises improved understanding of what a horse is telling you, and provides simple replies you can use to tell him that you “hear” him, you “get it,” and you have ideas you want to share with him, too. 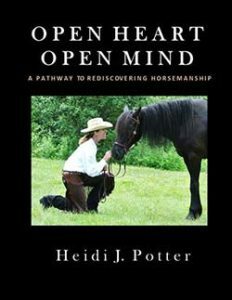 Open Heart, Open Mind was written for the horse and the horse lover. 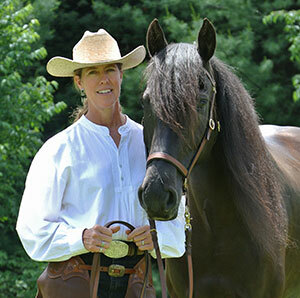 Follow Heidi, Master Instructor, Clinician and Trainer as she shares how the value of mindfulness, understanding and compassion towards horses will guide you to a truly natural and holistic form of horsemanship, one based on understanding and connection, rather than dominance. Discover how her journey in Traditional Martial Arts and the application of Eastern Philosophies combine to create the “Five Elements of Successful Horsemanship”, Breathing, Centering, Grounding, Awareness, Mindfulness, and Blending. Learn how these elements can enhance your horsemanship along with your daily life. This 140 page, beautifully illustrated book includes exercises, case studies, lessons in horsemanship and the successes and failures of working with horses of many levels, ages, breeds and temperaments. Does your horse have any undesirable behaviors that you would like to change? Read about Positive Reinforcement Training methods and how they can be used to reshape those behaviors in a safe, effective and enjoyable manner. Order your copy today and take the first step in creating a more enjoyable, safe, trusting partnership with your equine friend. Hosting a Clinic is Easy! And hosts earn a free spot in the clinic! Learn what’s involved in hosting. Choose from one of Heidi’s standard clinics or contact Heidi about designing an event tailored especially for you and your group.